When I started DLM Consultants I went to market with three packaged services as well as an option for bespoke consultancy. It went very well and we are still here two years later. The team has grown (more on that in an upcoming blog post) and through that growth we have developed the ability to take on bigger and more complex projects. Business is going well. That said, it’s always good to review our core offering. In this post I’m going to talk a bit about our DLM Workshops and a few pre-cons that we have in the pipeline. I created the original content for the DLM Workshops back when I worked for Redgate with PASS President Grant Fritchey, SQLServerCentral Editor Steve Jones, Redgate Head of Pre-sales Engineering Tom Austin and Redgate DLM Product Manager Stephanie Herr. These were intended to support Redgate customers to adopt DLM or Database DevOps best practices using Redgate tools. From the start the strategy for these workshops was to allow Redgate consulting and training partners to deliver the content to their paying customers. We were trying to create a new channel for Redgate licence sales. I spent a bunch of my time in my last year at Redgate training Redgate partners to deliver the workshops so when I moved from a Redgate employee to a Redgate consulting and training partner it was a natural progression for me to take the DLM Workshops with me. After some discussions with Redgate, that’s what happened. While the DLM Workshops consistently had great reviews, it is fair to say that they were fairly Redgate-centric and I wasn’t great at selling tickets, especially to the US market. The EU workshops were making a profit, but not a big one, and they were distracting us from more profitable work. Something needed to change in order to make them sustainable. Redgate are still an important partner for us because they create great software – and we will still regularly use it in the workshops. However, we will be re-writing a bunch of the content from a more objective perspective. We’ll spend more time discussing some of the really important higher level decisions that you need to make, such as whether to use a shared or a dedicated database development model, whether to use a model or migration first source control strategy, which branching strategies work well for database development, how the GDPR and other data protection regulations/concerns impact our our development processes and which tooling options are available on the market to support you (Redgate or otherwise). We are going to update all the content and condense the old three-day workshops into a two-day workshop. This will provide a far more content rich workshop which will be easier to fit around your other projects. We are going to upgrade all the VM infrastructure. Until recently we were still using the original VM images hosted by Redgate. Now DLM Consultants will be hosting our own VMs for attendees. They’ll be bigger, faster and you’ll be able to log on to your VM the day before and keep the same VM for the duration of the workshop. We will also provide instructions to recreate identical VMs to reproduce the workshops on your own infrastructure. We will be partnering with Brent Ozar Unlimited to bring the workshops to the US market. Brent has been a big supporter of DLM Consultants and I love the production quality of his classes. I’m really excited to learn as much as I can from him about how to create top quality training classes and how to market them effectively. 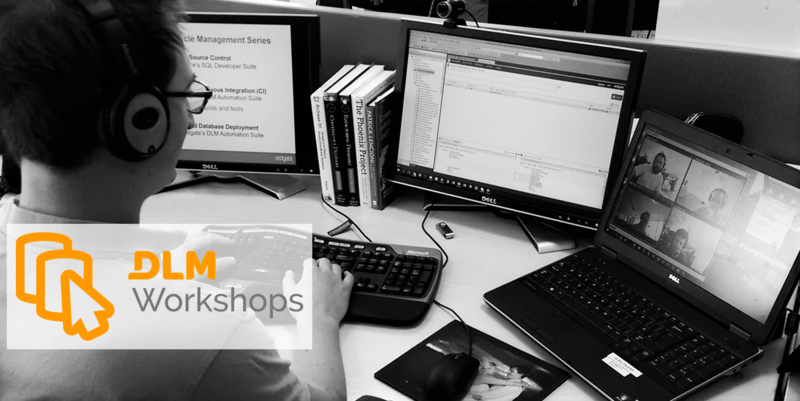 In the future we hope to additionally offer versions of the workshop which using a pure Microsoft tool stack (SSDT), and a pure open source tool stack – so if those workshops sound exciting to you stand by for an announcement later in the year.